Happy birthday to granddaughter Charlie who turns 5 today! This young miss arrived in the world as a confirmed girly girl. Among her passions are dance and art, activities she pursues with concentration and joy. 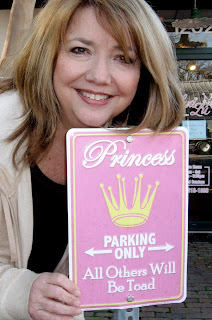 Yesterday I had just been in Lexie Lu, a superlative children's and infants' wear boutique in our hometown, when hubby Walter pointed out the "princess parking" sign. This sign is for you, Charlie, one of our favorite princesses! Pat Ladnier of Lexie Lu poses with a parking sign that announces grim consequences for non-princesses. Baboo and Nana love you, Charlie. Happy, happy birthday! Oh, she is so beautiful!! And that smile!!! 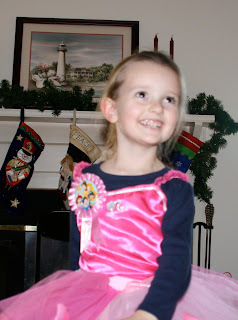 My granddaughter will be five next month, and she is for sure all girl and a princess. so we have this in common. I LOVE the sign!! Happy Birthday to your little princess. I'm finally on the mend and doing a little "catching up". I'm glad that your family survived Christmas intact. I loved the photographs.